Little Giant RS-5 (599008) Piggyback Diaphragm Switch provides automatic control of any pump up through 1/2 HP (115V, 10 max. run amps) in water and sump applications. Designed to operate in applications with limited space. Includes 10ft power cord. The Little Giant RS-5 for submersible pumps can be used either by attaching it to the 5-MSP pump or used separately with other pumps to control on-off operation of the pump. The switch is activated by pressure to a diaphragm, caused by rising water around the switch housing. When mounted to 5-MSP or 6-CIM-R pump, "on" level range is 6" - 9", "off" level range is 1" - 4". The differential between "on-off" levels is 6" (+/- 1"). 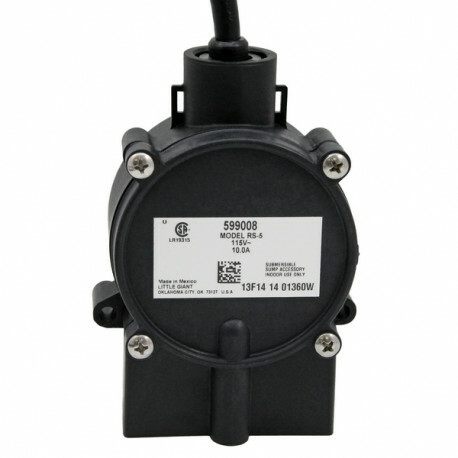 Little Giant Diaphragm Switches are available in a standard configuration, RS-5, and a low level RS-5LL series.